As anyone who’s seen “Sunset Boulevard” knows, the movie has a great line of Pomona dialogue. It almost had a reference to San Bernardino too, but it got cut. Sorry, Berdoo. I explore that in Friday’s column. 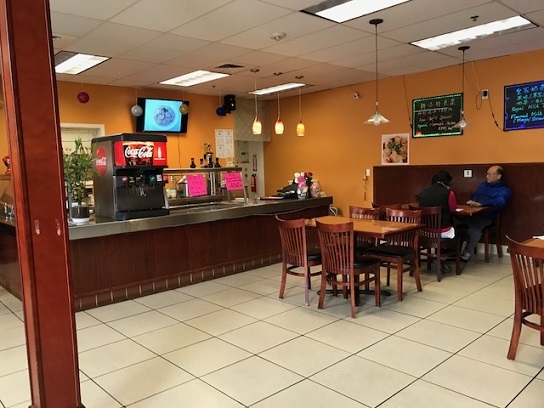 The 99 Ranch Center at Base Line and Archibald in Rancho Cucamonga is home to several Asian eateries: Min’s Dumpling House, Red Chili House, a boba shop, Myung Dong Tofu House and the food court inside the 99 Ranch market. 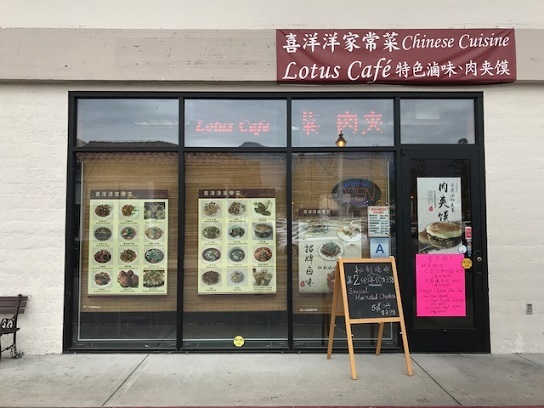 Connected to the market but with a separate entrance is the small Lotus Cafe, where two friends and I had lunch recently. It’s a modest place, and they offer steam table basics for quick service, but they also have an extensive menu. Not Min’s-extensive, with 100-plus items, but there’s dozens to choose from. 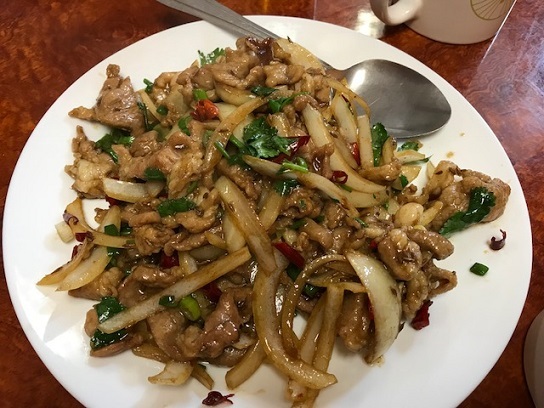 Reviewer David Cohen says the cuisine is from northern China. 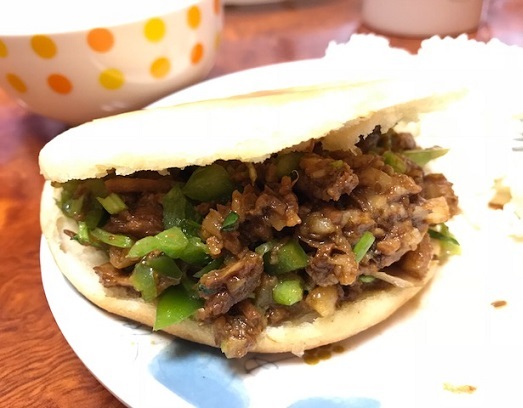 The Chinese burger was ground pork inside a rice bun with cilantro and grilled onions, and very tasty. It might not be dissimilar to a Maid-Rite sandwich. 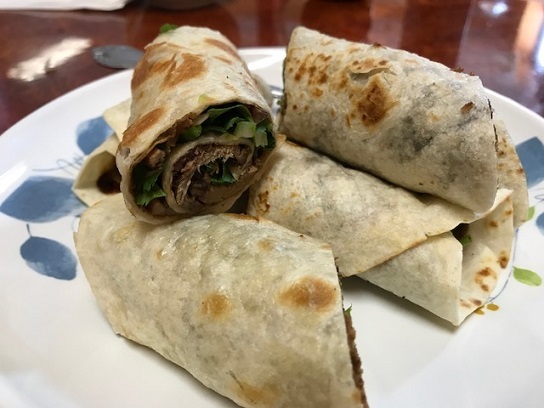 In descending order, we ranked our items this way: dumplings, lamb, burger, beef roll and kung pao. And there was nothing wrong with the kung pao, except that the peanuts were on the side, which bothered the guy who ordered it. He ate them by hand, like bar snacks. The only problem with the meal was that the beef roll (above) arrived about 45 minutes after everything else. The server updated us a couple of times on its progress. Not sure what the issue was there; it’s possible they had to buy an ingredient at the market. Thankfully we weren’t in a hurry, although we also weren’t hungry anymore by the time we got it. Not that that stopped us from eating most of it. 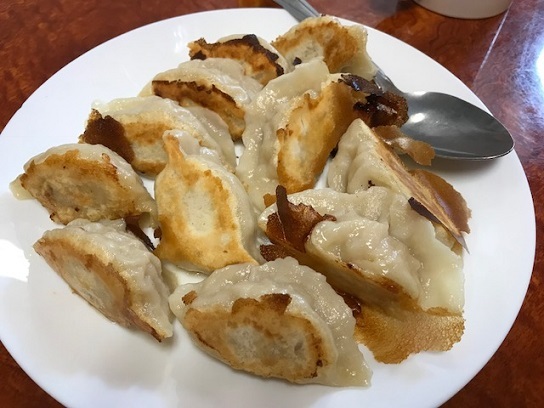 “I like Min’s better,” said the guy who had been there before, “but for a little place inside a grocery store, it’s good.” The other two of us agreed. Remember when I wrote about the midcentury modern home in Ontario designed by Paul R. Williams? At the time I didn’t know much about the man who commissioned it and lived there nearly six decades. But his daughter has filled me, and that story makes up Wednesday’s column. A lot of comments were posted on various Facebook pages regarding my Cal Jam II anniversary column from people who were there. I excerpt some of the more interesting and add details about the next-day cleanup in Sunday’s column. For your insider tidbit of the day: I had this one more than 90 percent written when I went home on Tuesday, with the intention of it being Friday’s column. But I was out sick the next two days. I felt well enough Friday to drag myself in to wrap it up. I hope to be back at full strength next week. I’m laid low, so no Restaurant of the Week today or column Friday, or possibly Sunday either. See you soon. I had the disorienting experience of a tweet of mine, about the journalist’s lot, going viral, with retweets, likes and comments from people around the United States and across the globe. It makes for a change-of-pace Wednesday column. 1974’s California Jam rock festival in Ontario tends to get the attention, including from me. But for the 40th anniversary of the 1978 sequel, California Jam II, also in Ontario, I’m rectifying that. I give the basics of the festival and a few little-known tidbits in Sunday’s column. I’m rarely johnny-on-the-spot when it comes to new restaurants. Either I don’t know about them or I wait until they find their footing. 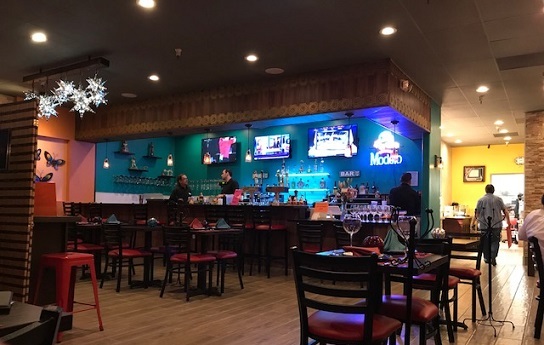 I wouldn’t have known about Sabor a Mi if a reader hadn’t alerted me within a couple of weeks of its early February opening and even invited me to join her and her husband for dinner. So a recent evening found us meeting up at the restaurant, which occupies a storefront within the Thomas Winery Plaza. It’s very well-appointed, with tasteful decor, art on the walls, Edison bulbs and an inviting bar. The menu has starters, salads and entrees ($14 to $19). 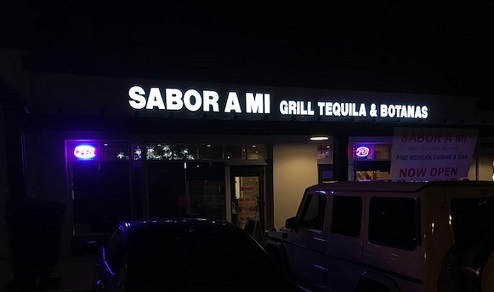 Sabor a Mi does not have tacos or burritos, but rather empanadas, carne asada and mixiote. Our table ordered conchinita pibil ($16), chicken enchiladas with mole ($16) and mole poblano ($18), pictured in that order below. 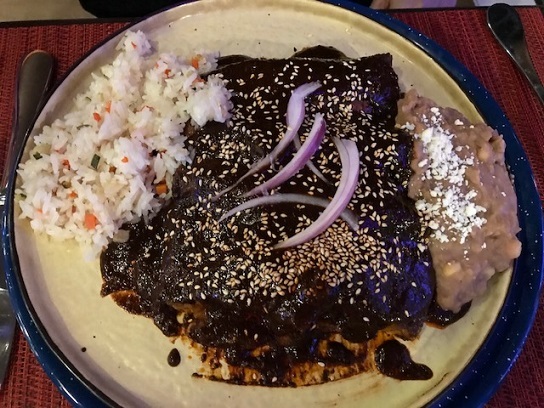 The first is slow-roasted pork in Yucatecan style, the second is self-descriptive other than perhaps the dark sauce (typically containing chocolate, fruit and various spices) and the latter is boneless leg and thigh chicken, also in mole. We liked all our dishes; mine was the poblano, which came with handmade tortillas. 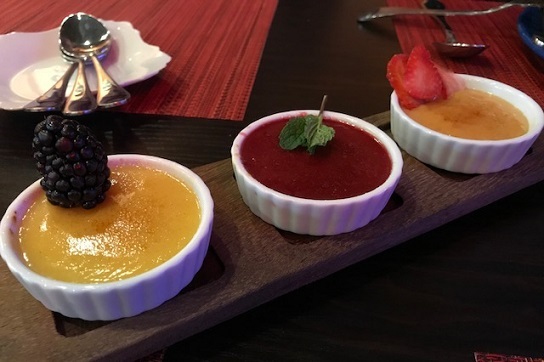 For dessert we shared the creme brulee trio ($6), which were flavored with guava, jamaica and horchata, respectively. Excellent. Sabor a Mi, by the way, is a popular Mexican song — Eydie Gorme, of all people, did a version in 1964 — and translates as Taste of Me. The Cordon Bleu-trained woman behind the restaurant has worked her way up in the business from bussing tables to chef to owner. 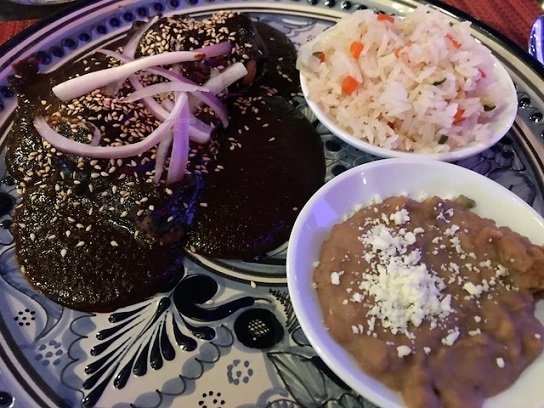 The menu has items from various states in Mexico, including mole birthplace Puebla, Michoacan, Mexico City and the Yucatan. Service was friendly and the owner visited our table as she made the rounds of the room, a nice touch. Things weren’t perfect: The waiter misinterpreted our declining the guacamole appetizer as an order for the guacamole appetizer ($8), not that we minded, one of my sides was wrong and when he brought back the bill and credit card slip, he had to apologetically explain that he’d at first charged another table on the card before realizing his mistake and voiding it. No harm done. On the other hand, there were little extras, like an aperitif of pork rinds with avocado and sprouts, and small complimentary dishes of avocado ice cream. My friends had been there before and also gotten such fillips. They said the service was better this time. So, be patient. 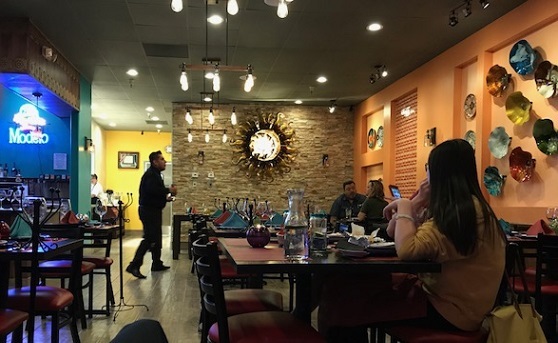 Few other restaurants in the area (Sabor Mexicano in Pomona comes to mind) seem to be doing quite what Sabor a Mi is attempting, and good for them. 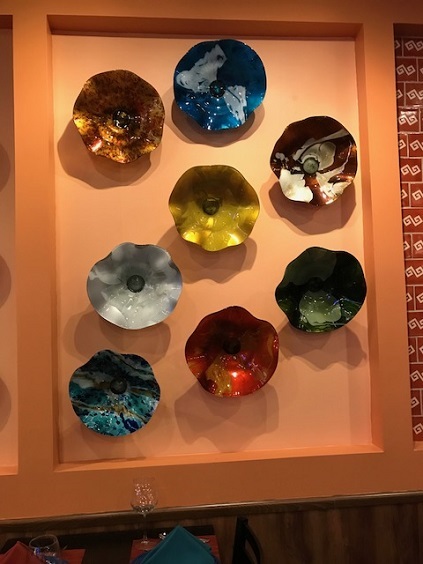 Sabor a Mi is also one of the most stylish local Mexican restaurants. 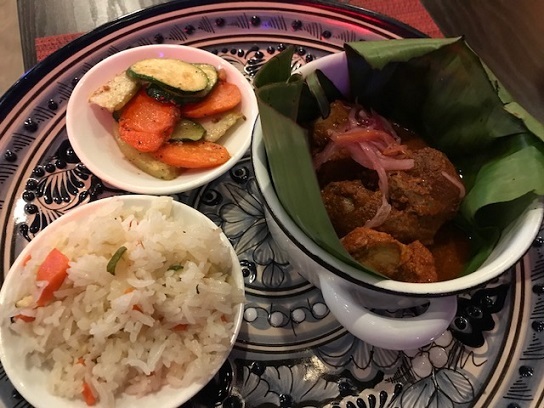 They serve beer, wine and tequila, and a Mexico City-style weekday lunch special, comida corrida (“lunch on the run”), with three courses served simultaneously, promises to get you out within 30 minutes. But maybe you’ll want to linger. For nearly nine years I’ve been keeping track of my pie consumption at Flo’s Cafe in Chino, where the diner has its own bake shop. I’ve tried 57 varieties, pretty much everything they’ve made in that time. For a few years now it’s been on my mind to write about it, but I wasn’t sure how to approach it: Did I need to assign a photographer to shoot me being served a slice? But Pi Day happens to coincide with my column this year, and so I’m pleased to finally tell the story of my quest alongside that of the Flo’s bake shop in Wednesday’s column.